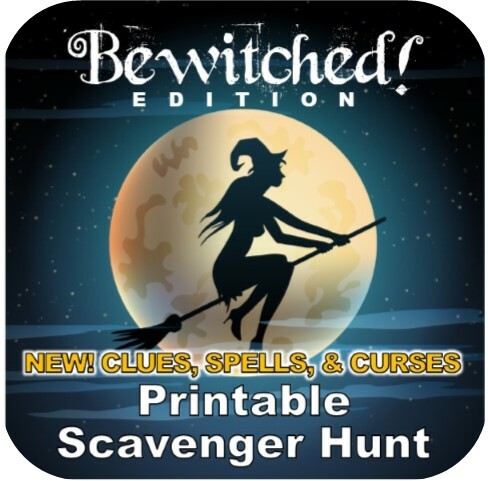 My original Halloween Clues, Spells, & Curses Scavenger Hunt has been my biggest hit for the past three Halloweens. The original printable party game is awesome, but I wanted to create another one that still involved clues, spells, curses, mystery, and fun - but in my NEW hunt you will be able to play multiple times because the solution to the hunt changes with each game! 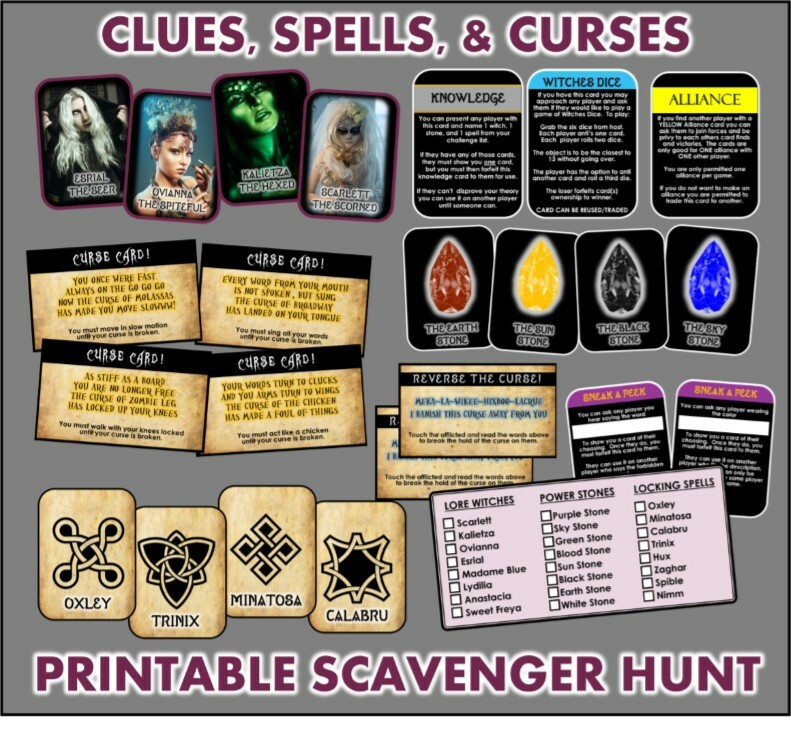 This hunt mixes elements from the board game Clue or Cluedo, but take away the board and replace it with a scavenger hunt - add in some fun elements like magic, clues, curses, spells, and witches and you have THIS game! The goal of this hunt is to figure out how to break a certain spell that has captured the "treasure" inside a magic stone. The spell can be broken when you figure out which witch cast it, what spell they used to cast it, and what magic stone they used to capture it in - much like the board game Clue where you have to figure out who did it, with what, and where. Players race around the playing area to find The clues to determine which Witch cast which spell using which stone? Players must determine Which one of these witches cast the spell? There are 8 printable cards (game cards) that represent each - an example of four of each are shown above. At the beginning of the game the host randomly removes one of each type of card and hides the others. Players must race around the playing area finding the cards and marking them off their list of possibles until they have narrowed it down to the three that are part of the spell (the cards the host is holding). The first player to do this wins!! In the Clues, Spells, & Curses Scavenger Hunt players race around looking for the cards they need to break the spell that is hiding the treasure (as described above). Once they find a card they hold onto it - so how do players find out what cards other players have in order to eliminate them off their cards? That is where the fun multiplies!! Curse Cards: These cards allow the players to "curse" another player. 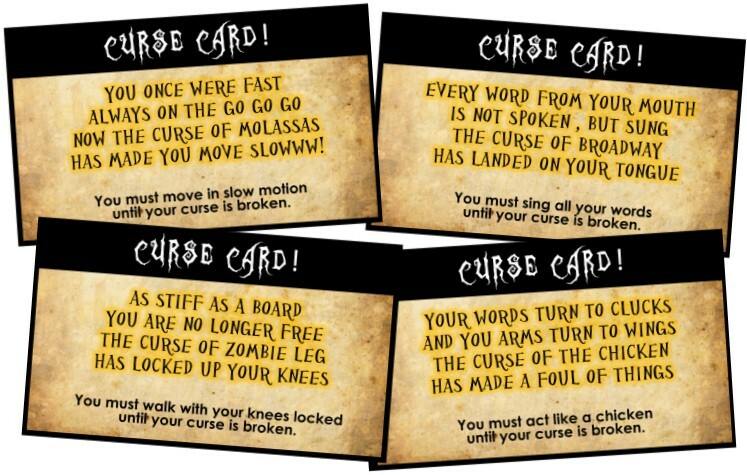 There are eight different curse cards which each feature a different curse. 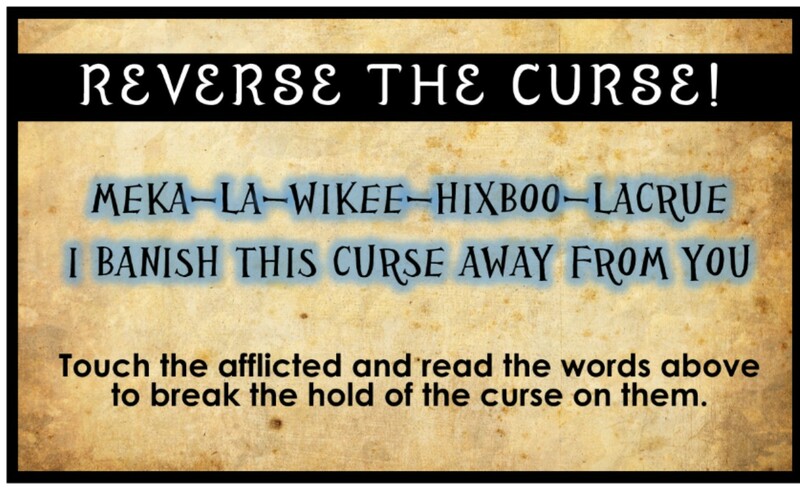 To curse another player, the player that found the curse card must touch the player they want to curse and say the words " YOU ARE CURSED". At that point the player stops, and you read the cards specific curse outloud and hand them the card. They must act out the curse until another player comes along to reverse the curse for them. BAD NEWS for you is that you lose the curse card, once their curse is reversed they can use the card to curse another. Reverse the Curse Cards: When a player finds a Reverse the Curse card they have the ability to break ANOTHER players curse. Players who are cursed can "pay" a player to break their curse by revealing to them one of their game cards. Once a player uses their reverse the curse card they must forfeit it to whoever originally cursed the person. Knowledge Cards: Knowledge cards allow players to ask other players if they have specific cards. 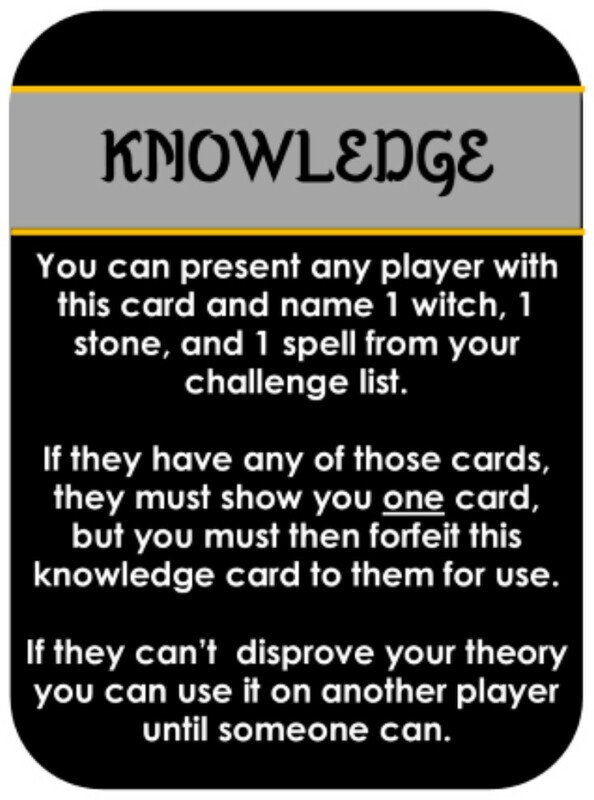 They can name one witch, one spell, and one stone - and if that player has any one of them they must trade one for the knowledge card. They can then use the knowledge card for themselves. 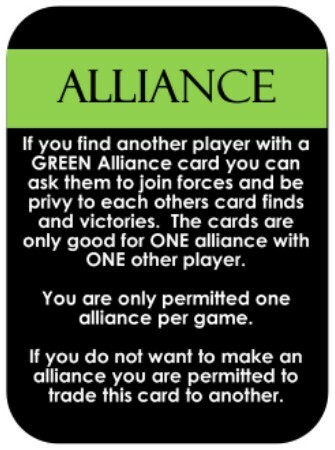 Alliance Cards: Alliance cards allow players to join forces with another player and become a team. There are two alliance cards in each color, for a total of 16 alliance cards. Players are allowed to form an alliance with the player that matches their color. Sneak a Peek Cards: Players who find one of these cards are allowed to sneak a peek at one of the players cards who fit the description on the card. For example, a sneak a peek card may permit you to see a players game card if they say the word WITCH, or if they are wearing the color PURPLE. The best part about these cards is that you decide what the circumstance is (the word, the color, the action) - this way you can change it for each game to keep repeat players on their toes. 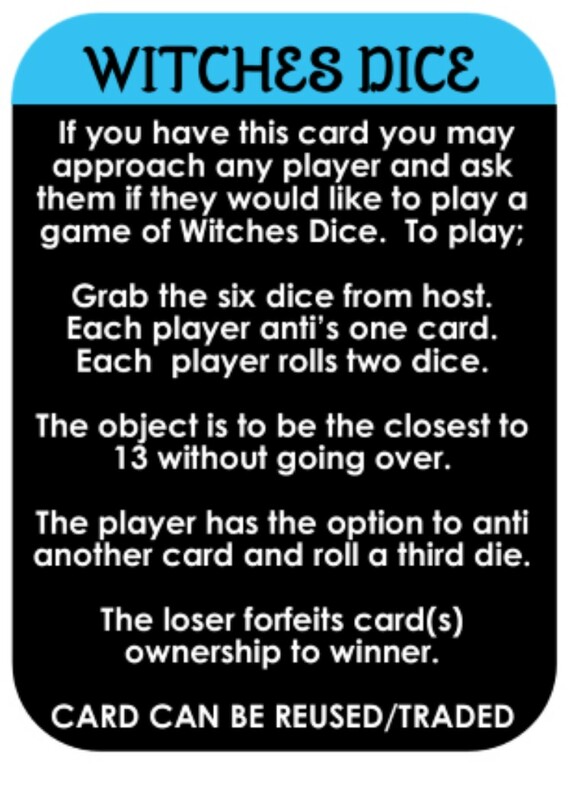 Witches Dice card: If a player finds a Witches Dice card they are permitted to ask any other player to join them in a game of chance called Witches Dice. In this game both players anti up game cards and roll the witches dice - the winner keeps the other players game card. Each player will also receive a players card to help them keep track of what they have found. Once they discover a witch, stone, or spell they can mark it off on this sheet. 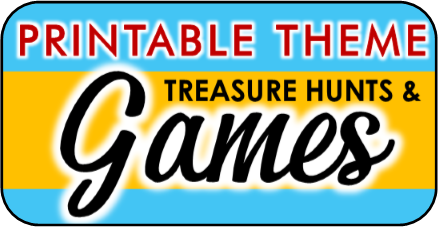 The first player, or team, that figures out the correct witch, the correct spell, and the correct stone that was used to hide the treasure can win the game. They must grab the high wand from the middle of the playing area, hold it above their head, and call out their answer to the host. If they are correct they win - if they are wrong they are not allowed to make another guess for 10 minutes. NOTE: The HIGH WAND is not a game piece that is included in this game, it can be anything wand like - people usually use a stick from their backyard. It is only a prop to add to the novelty of the game. Is this game specifically and ONLY for Halloween? No, unlike the original version this game does not have a Halloween motif. It does feature witches, magic, and such and is often used for Halloween parties, but there is nothing about it limits it to just Halloween. This game would be great for a witch theme, a supernatural theme, or any number of other themed events. 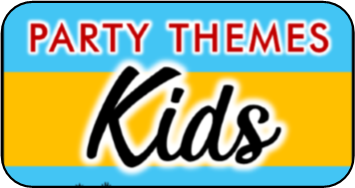 AGE RANGE: Ages 8+ - Great for kids, teens, adults, or a mixed group. NUMBER OF PLAYERS: 6-16 players is recommended. You can play with less but not more. ADDITIONAL ITEMS NEEDED TO PLAY: at least six dice, 65 envelopes, a stick or something similar to use as the HIGH WAND, and plenty of playing space to hide the envelopes throughout. 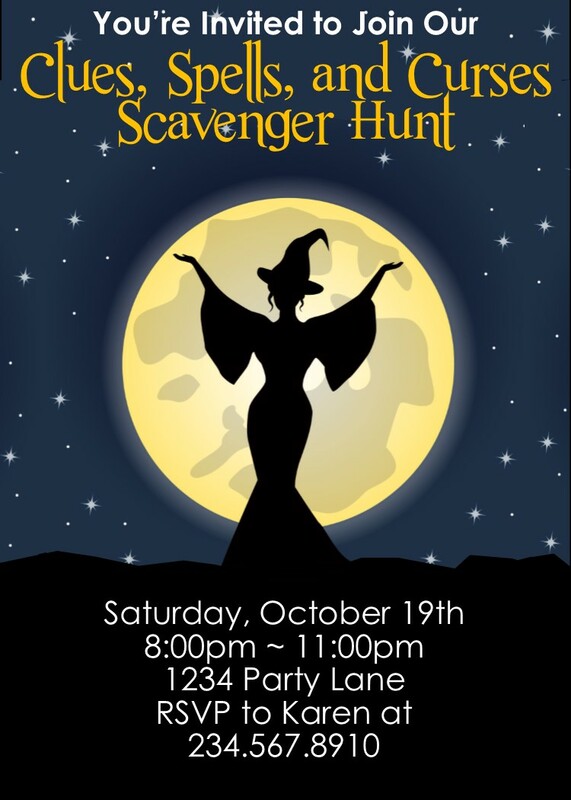 This editable invitation was created to compliment our Clues, Spells, and Curses Scavenger Hunt. It comes in a PDF file that includes 2 (5x7) invitations per page. You will need Adobe Acrobat / Adobe reader to view and edit. This comes already installed on many computers, but if you don't have it you can download it for free at adobe.com. Once you open your file you can edit the text easily by clicking on the sample text and replacing it with your own. Our editable invitation let's you edit all the text and replace it with your own. After you are finished personalizing your invitation simply print and cut. They are ready to be delivered!